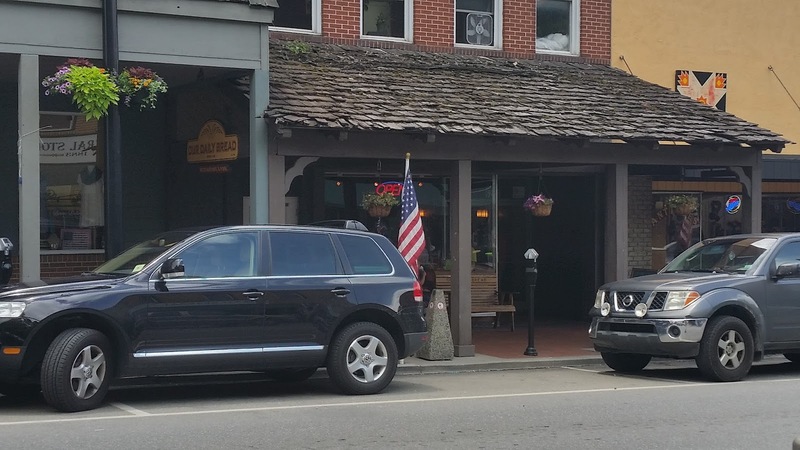 This edition of Excited about Eating takes us to the Boone/Blowing Rock area in the mountains of North Carolina. 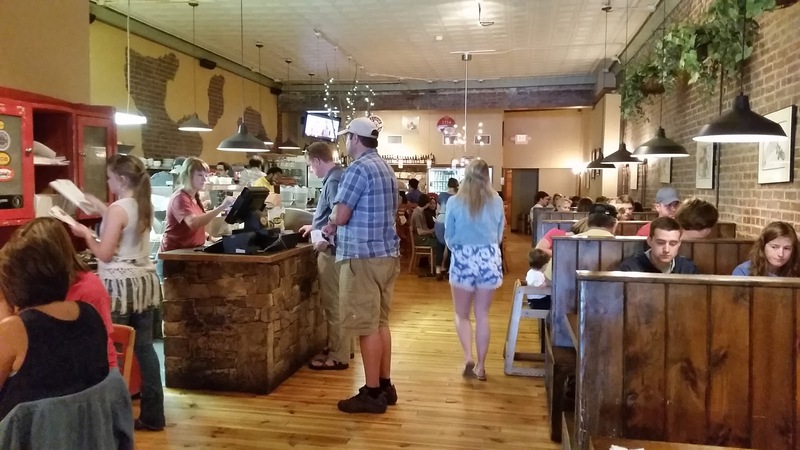 Our first stop is Our Daily Bread, a casual upbeat delicatessen. 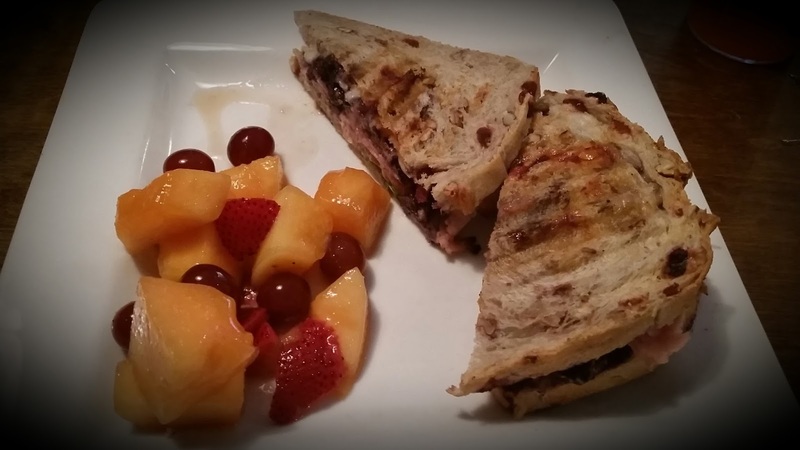 From the menu, you can tell this deli focuses on blending unique ingredients together to make unusual sandwiches. 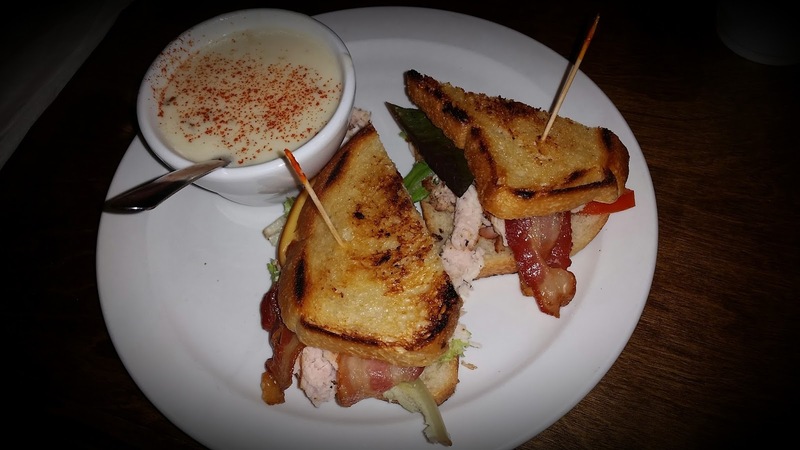 I chose the Smoke Stack, a combo of smoked components (smoked turkey, smoked applewood bacon, melted smoked Gouda), along with chipotle aioli, tomatoes, and spring greens on sourdough bread with a side of Sweet Basil Corn Chowder. Loaded with corn in a creamy broth and a sweet basil undertone, the soup was great. But the sandwich was outstanding. All of the different smoked flavors worked well with the chipotle aioli, and the toasted sourdough bread held it all together. Dora here. 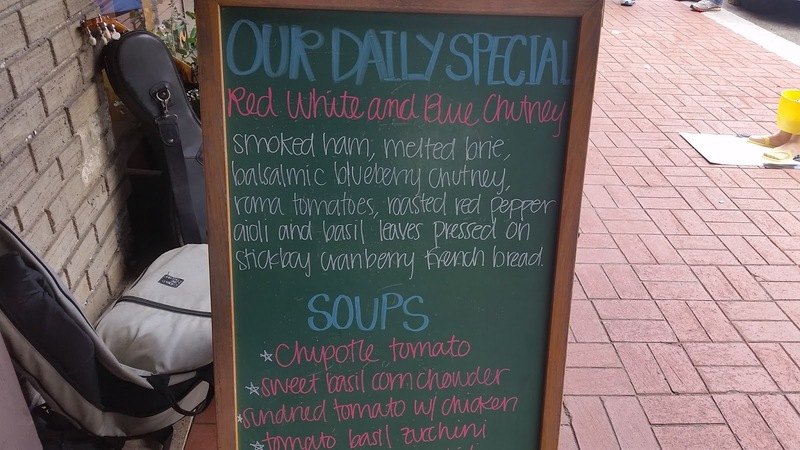 Since we visited on the Fourth of July, I opted for the daily special, the Red White & Blue Chutney Sandwich. Smoked ham, melted brie, balsamic blueberry chutney, tomatoes, roasted red pepper aioli and basil leaves pressed in cranberry French bread. Hello! Blueberry chutney? Doesn’t that sound fabulous? Well, it was. A melt-in-your-mouth mixture of everything I like about breakfast and lunch. Yum! Definitely adding this place to our “must visit” list. 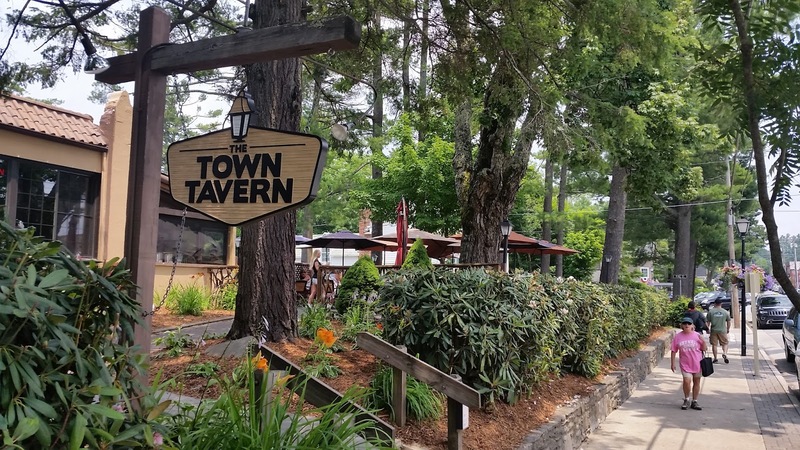 Our second stop is Town Tavern in downtown Blowing Rock. It was a beautiful day, so we decided to sit outside. 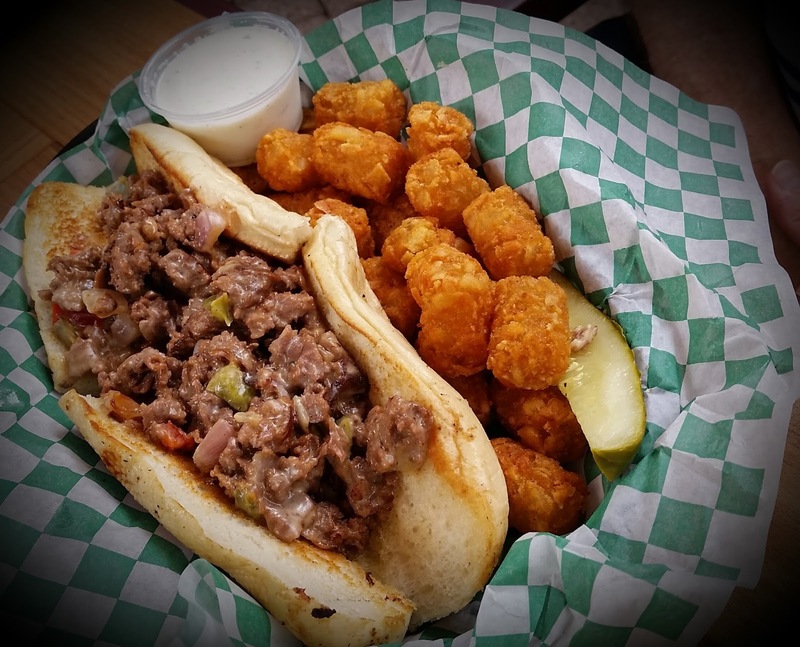 For lunch I chose the Tavern Philly Cheesesteak served on a Milano roll with a huge amount of thinly sliced rib eye steak, American white cheese, peppers and onions and a side of Tater Tots. This sandwich was unique in that the components were all cooked together giving it great flavor, as opposed to cooking individual ingredients and layering. 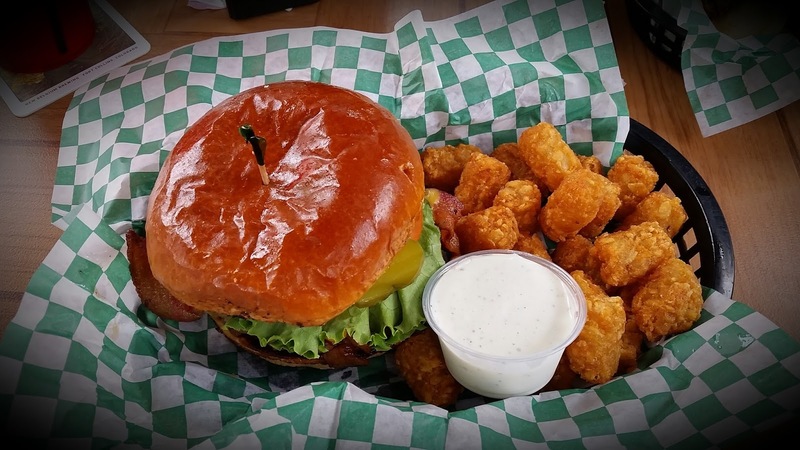 Not only was the sandwich great, the tater tots were just the way I like them. Crispy. Dora here. Burgers are my go to meal when we’re away from home, and I hadn’t had one all week. The Bacon & Cheddar burger satisfied my burger craving. Meaty and juicy, and the slightly toasted bun makes this meal a winner! Oh, and the creamy ranch dip for tater tots now replaces boring ketchup! We rate this restaurant 5 forks out of 5 for a family friendly restaurant that serves outstanding food. Your turn. What’s your favorite go-to meal when you’re away from home? The Red White & Blue Chutney sandwich looks delicious! All your beautiful food photos are making me VERY hungry. Yes, tater tots with ranch dressing….must try! Oh, it was, Sherida. YUM! And definitely try the ranch dressing. 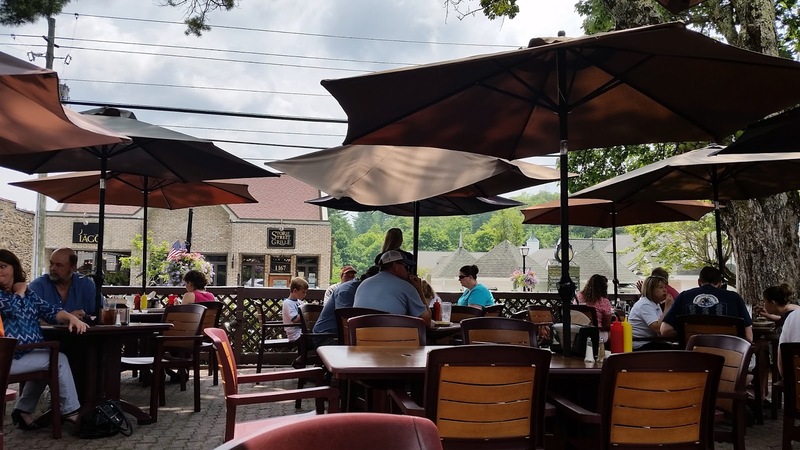 We ate a while back at the Sixpence Pub in Blowing Rock at the recommendation of some highly acclaimed food critics and it was great! May try one of these places next time. Kirk, Sixpence is one of our favorites, but I think you will think these places are also great also. We are always looking for new places to try when we travel. Not sure of the title “food critics”, I like food blogs better. Thanks Sherida, I think tater tots are good with anything.